You’re not ready for the new season until you complete this risk- management checklist. With everything from hazardous chemicals to heavy equipment, aquatics facilities are a potential land mine for risk managers. Here’s an opening season checklist to help you diffuse safety issues before they become explosive. Inspect barriers. Ensure that chain link hasn’t been cut and vertical rails in fencing are no more than 4 inches apart. Use a tape measure. Your eye may not detect a quarter inch of additional space, but that little bit of extra room may be all a child needs to squeeze through and into your facility. Avoid ornamental fencing with horizontal members because youngsters may find this tempting to climb. Likewise, do not position benches next to fences. This can give a climber just the boost needed to get up and over your fence. 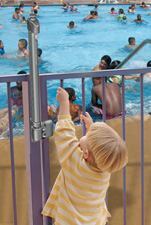 Make sure all gates open outward, are self-closing, and have latches installed out of the reach of children. Updaterecords. Contact the Health Department, the Agriculture Department and any other government agency for which you must maintain records. Ask for a copy of their report forms. Use this as a basis for the records you keep at your facility. Make sure logs are filled out accurately and consistently — they may be your best defense if an incident leads to litigation. Train your staff on what to include and what to exclude on chemical test logs and incident reports. Facility records should be limited to facts; opinions should be saved for staff discussions. Run In-service training. This should be done with the entire staff before opening the pool for the season, and then regularly throughout the season. Emergency skills should be practiced in the setting where they’ll be used. Ensure that all equipment is operational and all certifications are up to date. Check signs. Make certain that signage meets code, is properly positioned and easy to understand. Measure water depth and check to see if depth markers are correct. Install the international “No Diving” symbol alongside each depth marker in shallow water. At emergency telephones, place signage that indicates whether callers should dial “911,” “9-911” or just lift the receiver and listen for Emergency Services to respond. Review chemical stock. Call the Agriculture Department to pick up chemicals that should be disposed of. Store fresh chemicals in their own containers or in new storage vessels. Do not combine chemicals to save storage space. And do not store incompatible chemicals — for example, chlorine and acid — in the same area. Check with your fire marshal to determine how much flammable material may be stored on site. See to it that fire extinguishers are full, and emergency stations for eyewashes and showers are flushed out. Update your MSDS manual. Enlist experts. Use them for technical assistance with electrical and gas-powered equipment. Have an aquatic safety expert review your facility’s emergency action plan and do a thorough site inspection each year. If diving boards, slides, chemical feed equipment or filtration equipment need service, contact the manufacturer for a list of certified service providers. Doing the work yourself could save money in the short term, but may open you up to unnecessary liability. Take measure. Measure the length, width and depth of each pool, and calculated gallonage. Just as a doctor must know your weight to properly prescribe medicine dosages, you must know how much water is in your pool to determine proper chemical dosages. Invest in a new test kit each year, and read and follow all directions. Test the incoming water as well as the pool water so you can anticipate the effect of fill water on pool water balance. Examine pool inlets and outlets. Main drain covers should be intact and securely fastened. Also remember to follow new federal pool legislation regarding drain covers. Eyeballs on wall inlets should be angled to direct circulation toward dead spots. Floor inlets should not present a trip hazard. Vacuum outlets should have self-closing covers, and grates should be free of cracks and chips that could result in injury. Skimmer covers, baskets and weirs should be inspected for damage and replaced if necessary. A skimmer without a weir cannot function properly. Test flow meters,and pressure and vacuum gauges. Are they intact and properly installed? Replace gaskets or O-rings on pump strainers annually to ensure that lids seal tightly. Likewise, replace rubber parts on chemical feed equipment each year and inspect plastic parts for degradation due to chemical contact. Clean vent covers in chemical storage rooms and equipment areas. Ensure that air exchange rates meet standards and that chemical storage room air is not vented into the pool area.